Starting today, Nabisco, proud sponsor of the 5 Second Of Summer 2015 North American Tour kicking off on July 17, 2015, is giving 5SOS fans the chance to rock out with their favorite band! Now through September 4, 2015, visit Nabisco5SOS.com and enter for a chance to win a four (4) day/three (3) night trip to see 5 Seconds of Summer live in concert in one of the following tour stops: Irvine, CA; Houston, TX; or West Palm Beach, FL! Each trip includes roundtrip coach-class airfare for four (4), hotel accommodations, tickets to the 5 Seconds of Summer concert, opportunity to attend a sound check and meet and greet, and more! 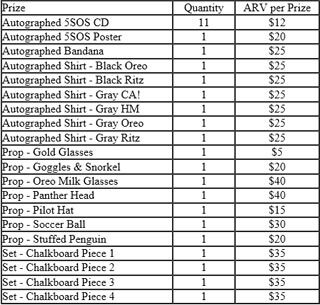 Nabisco will be giving away fifteen of those trips, five per entry period, plus thirty instant win prizes, one per day, including autographed 5SOS merchandise, props and more for a total of over $110,000 worth of prizes in the 5 Seconds Of Summer Back To School Sweepstakes And Instant Win Game! Enter every day for your chance to see 5SOS in concert! The more you enter, the more chances you have to rock! The Promotion, which consists of a Sweepstakes and an Instant Win Game, starts at 12:00 am ET on June 8, 2015 and ends at 11:59 pm on September 4, 2015. The Sweepstakes will be held from 12:00 am ET on June 8, 2015 to 11:59 pm on August 5, 2015 while the Instant Win Game will run between August 6, 2015 at 12:00 am ET and 11:59 pm ET on September 4, 2015. Entering is easy! To enter the Sweepstakes, go to Nabisco5SOS.com and get started by submitting your email address. Next, register as instructed and submit the registration form to receive one (1) entry into the Sweepstakes for a chance to win tickets. Be sure to enter every day through August 5, 2015 for more chances to win. Then, return to nabisco5sos.com starting on August 6, 2015 and follow the instructions to complete an Instant Win Game play to see if you’re an instant winner. Five (5) Entry Period #1 Grand Prizes : A trip for four (4) to Irvine, CA for the 5 Seconds of Summer Concert on July 20, 2015. Five (5) Entry Period 2 Grand Prizes : A trip for four (4) to Houston, TX for the 5 Seconds of Summer Concert on August 8, 2015. Five (5) Entry Period 3 Grand Prizes : A trip for four (4) to West Palm Beach, FL for the 5 Seconds of Summer Concert on September 13, 2015.